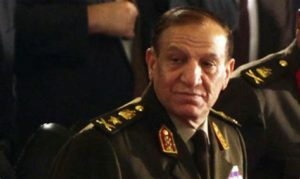 General Sami Anan, Chief of the army under Hosni Mubarak, announced he would bid for the top position in March Presidential elections. The announcement came just days after military comrade Ahmad Shafiq abandoned his presidential plans. Anan is proposed by his party, Arabism Egypt Party, which said Thursday that the ex-commander has nodded to the party’s request. “The party leaders took a decision for General Sami Anan’s candidacy and informed him of the decision, and there was no problem at all and no objection,” from him, said Sami Balah, the party’s secretary general. The 68-year old served as the chief of staff of Egypt’s Supreme Council of Armed Forces under President Hosni Mubarak from 2005 to 2011. He was also second commander of the army behind Field Marshal Hussein Tantawi in the wake of the 2011 revolution which swept away Mubarak. Both Anan and Tantawi were put on retirement by first democratically elected President Mohamed Morsi in 2012 – a move many believed was to shed the army’s grip on power after the democratic elections. Morsi was himself removed in 2013 by then-defense minister general Fattah al-Sisi, in a move deemed to break Morsi’s Islamist agenda. A year later, Sisi won the presidential elections. The National Election Authority early this week set Presidential elections for the end of March. President Fattah al-Sisi has not declared his candidacy yet, but there are cards that he will seek a second term. He will likely win unchallenged even though London-based The New Arab, citing an anonymous source, said Anan’s candidacy is ticked out in Riyadh, which supported Morsi’s ascendance to the country’s top job. Al-Sisi’s likely challenger, the former Prime Minister and Mubarak’s close aid, Ahmed Shafiq who narrowly lost to Morsi in 2012 has bowed out of race after he had announced, from his exile in the UAE, his intention to run for the elections in a video aired by Al Jazeera last November. According to London-based Middle Eat Eye (MEE), the former presidential hopeful was threatened by intelligence agencies to reveal allegations of his sexual misconduct and corruption if he did not withdraw his candidacy. His campaign suggested that it could support Anan’s candidacy, MEE reports. Written by: Jaber Ali on January 12, 2018. Posted by Jaber Ali on Jan 12 2018. Filed under Uncategorized. You can follow any responses to this entry through the RSS 2.0. Both comments and pings are currently closed.